Jose Mourinho says he wants to rest key players for Chelsea's trip to Premier League leaders Liverpool on Sunday. The Blues are still in the title race with three games left but Mourinho wants to focus on the second leg of his side's Champions League semi-final with La Liga leaders Atletico Madrid. However, he says the decision to rest certain players may not be his to make. "I can't decide by myself," said the Blues boss. "I'm just the manager. I have to listen to the club." Chelsea's 2-1 defeat by Sunderland last weekend means even a win at Anfield might not be enough to stop Liverpool from winning their first title in 24 years. However, Manchester City, who have a game in hand over Chelsea and Liverpool, can still win the title on goal difference if they win their remaining four fixtures and Liverpool lose a game. When told that resting players against Liverpool might not please City, Mourinho said: "I think I will do it, but we have to speak internally." After losing captain John Terry and goalkeeper Petr Cech to injury in Tuesday's 0-0 draw against Atletico Madrid, Mourinho believes next week's return leg at Stamford Bridge is the more important fixture. Frank Lampard and John Mikel Obi are suspended for the second leg of the semi-final, so are likely to feature against Liverpool. Fellow midfielders Nemanja Matic and Mohamed Salah also cannot play in Europe because they are cup-tied, so could play at Anfield. Mourinho also thinks the game at Anfield should have been moved to Saturday from Sunday to help his side's European chances. He suggested Atletico Madrid had been aided by the Spanish authorities, although they play Valencia in La Liga on Sunday afternoon. 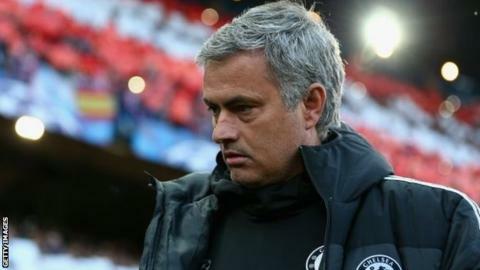 "We represent English football and we are the only English team that is in European competition," said Mourinho, who feels the Premier League could have done more to help them. "We ask, ask and asked again to play on the Saturday."